Your cousin or mine? Investigators at legal regulator forced to reveal links to lawyers. 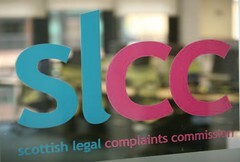 COMPLAINTS about dishonest or unscrupulous solicitors made to the Scottish Legal Complaints Commission (SLCC) stand little chance of a fair hearing, according to clients & consumer specialists who have unearthed a web of personal, business & other links between members of staff at the SLCC and solicitors and law firms under investigation by the so-called ‘independent’ regulator of Scotland’s legal profession. There are also accusations from clients, and even murmurs from some in the legal profession itself that certain solicitors under investigation by the SLCC, which took over complaints handling from the Law Society of Scotland in October 2008, have allegedly received inside help from within the legal regulator to escape expected punishment for poor and negligent legal service provided to clients & consumers. 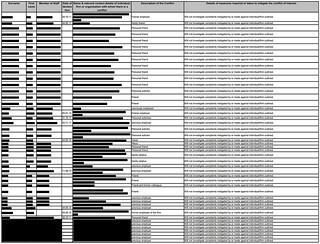 SLCC staff declarations of interest for 2011-2012 show true extent of problems for fair hearing at legal regulator. 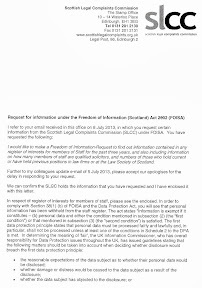 Amid the media investigation into links between the legal profession and it’s own regulator, a response to a Freedom of Information request made by Diary of Injustice journalists to the SLCC conformed that ‘special relationships’ between SLCC employees, the legal profession and the vested interests of the Law Society of Scotland are affecting complaints investigations. The SLCC also confirmed in it’s response to the FOI request the actual numbers of staff who have links to the legal profession and the body which represents Scottish solicitors best interests, the Law Society of Scotland. 15 members of staff qualified as solicitors. No members of staff hold current positions with the Law Society of Scotland or any law firm. 8 members of staff held a previous position at a law firm. 5 members of staff have held previous positions at a law firm and Law Society of Scotland. The SLCC refused to release the identities of any of those who have such connections, declaring it would not be in the public interest to do so. However, allegations have now been made that the numbers of undeclared meetings involving SLCC employees, solicitors, the Law Society of Scotland, and lawyers who represent solicitors who are the subject of complaints investigations far outweigh declarations made or even details known to the SLCC’s own board members, some of whom have suspected for some time that inappropriate contact between SLCC insiders and the legal profession has taken place. Speaking to Diary of Injustice earlier this week, a legal source known to have close links to the Scottish Legal Complaints Commission described the legal regulator’s internal complaints culture as “Cover my back quickly”. Commenting on the material provided to Diary of Injustice and SLCC’s response, the source described regular situations where solicitors being investigated were thought to have used influence to obtain internal details of clients complaints and statements not already handed over by the regulator after it became clear that lawyers and law firms under investigation appeared to have access to content held by the SLCC and were using it to pressure clients to close their complaint. In some cases, it has also been alleged solicitors and their representatives were using the SLCC’s own material to pressure the ‘independent’ regulator into closing investigations prematurely or refusing to investigate complaints point blank. In one case cited to DOI which cannot be published for legal reasons, it is alleged a solicitor who was the subject of a serious complaint involving a significant amount of client funds, secretly met with a member of the SLCC’s staff who is alleged to have provided information and an opinion of how far the complainant was willing to go with regard to their complaint, along with information on the complainant’s then legal representatives. It transpired a week after the apparently undeclared meeting between the solicitor and the SLCC insider, the complainant’s recently acquired solicitor suddenly withdrew from acting for them without any explanation, leaving the complainant’s family in a position where they have not been able to secure new legal representation since. With such close relationships in play, it is clear that staffing a legal regulator with legal insiders, family & friends has created a so-called ‘independent’ legal regulator with about as much credibility as the Financial Service Authority at the height of the UK’s Banking collapse. It may be acceptable to have a lawyer as legal adviser to a regulator but no way on earth should it be stuffed to the gunnels with lawyers posing as complaints investigators or staff. We saw what this cosy relationship between staff and the banks did to the FSA so why is it acceptable to have the same dysfunctional and potentially corrupt staffing arrangements at a regulator of complaints against the legal profession.Clearly they are not "independent" at all. Welcome to the world of recruitment in the public sector (although this slcc is paid for by lawyers and probably by clients somewhere along the line) where family members get the plum jobs on huge salaries and nothing more is said about it. This amounts to a concerted effort to cheat and humiliate those who make a complaint to the SLCC in good faith believing that they are a bona fide organisation? This passing of content sounds like good old criminality at play and all those excuses about not revealing their names etc is a lot of tosh! This is an absolute disgrace, although hardly surprising given Edinburgh's established reputation as a cesspit of corruption - just look at their banks conduct. In one of her final interviews she stated that the bill seeking to establish the SLCC was 'a mess' and would end in disaster - which is of course exactly what the Law Society of Scotland in Edinburgh wanted. Any staff member and board member caught participating in Side-Meetings with the intention of getting the crooked Scottish lawyer off Scot-Free should be reported to the police and charged with perverting the course of justice? For far too long have Scottish crooked lawyers have been freely allowed to commit crime and rob their clients blind? Darling.You remember the £300K and that farm you stole from the dead spinster and you used it to buy our maison in the South of France?Well her family made a complaint to us today but no need to worry because I will make sure they get told it is time barred or closed because of lack of evidence! The comments from the SLCC regarding staff contain the words "damage and distress" sounds as if they could have sued somebody, I wonder would that have reached the court? my bet is it would and they would have won. If this were a regulator of MPs and one of them had their relative or personal friend on it (regardless of whether they participate in complaints or not) there would be uproar all over the media. So why are the SLCC being given a free hand to fiddle complaints? Not that keeping it out of the papers does much good because all internet searches for how bad the SLCC are bring us right here! Little chance of complaints getting a fair hearing from this lot and anyway if one has a conflict another will have etc etc so what is the point of this so-called regulator and who is the lawyer lover who came up with the idea of it? There is one major point realised by your piece which all currently published comments seem to have missed. Given we now know from your reporting there are at least 15 SLCC employees with legal qualifications on around £40,000+ per annum (possibly much more) this equates to £600,000 in salaries alone from the £2.5 million the commission takes in funding each year from the legal profession. If the salaries figure is increased to £60,000 the annual bill for these 15 alone will be £900,000. So what I am getting at is that if we have 15 members of staff who are solicitors or have worked at the Law Society taking up to one million a year in salaries alone,this fact does tend to dampen the Law Society's annual whine at the amount fixed in the SLCC's Complaints Levy. If all the money is actually going to solicitors in salaries and as I see from your earlier reports the slcc board members and their £200,000 a year or so expenses claims then all the noise from the Law Society over the levy is now proved duplicitous. By any definition this commission is just a jolly for lawyers and nothing to do with providing a fair hearing for clients who find their lives turned over by their own solicitors yet it is clients who are having to pay for the commission to tell them they have no case to complain no matter how much the damage done to them by their own solicitors. They have been doing this from day one and that is exactly the way the Law Society of Scotland want it? The police are prevented from going in to make the necessary arrests because the Scottish crown office have told them they can carry-on-regardless in the pernicious method because they were protected from prosecution? All to make sure crooked Scottish lawyers get the lightest possible sanction? I wonder what the slcc staff think of this blog and your exposure of their rancid conflict of interests..they must hate all this getting out into the public domain! Nonsense.Anyone at a regulator involved in the complaints process should have their identities and full interests published and expect to be quizzed on it.If not go work somewhere else in the legal profession.The perception of and actual bias at this SLCC is staggering! Comment at 17:39 - agree 100%. This anonymity these people have clearly due to their inherent conflicts of interest has to be cut out of regulation if there is to be any public confidence in a proper independent complaints system which the SLCC never has been up to now. I imagine they hate it but there are many in the profession who love it just like many clients who will or should welcome this kind of information being published. Not a very open state of affairs with all that black ink considering former Scottish Information Commissioner Kevin Dunion is now on the SLCC's board. This is such a great post and very perceptive. The SHAM that is the SLCC has taken all of these former Law Society of Scotland Client Relations Office staff members and in one FOUL swoop has unburdened the Law Society of Scotland's wages bill by what? Say, £300,000.00 - £500,000.00? But because of the way that the SLCC has been set-up and stuffed with former Law Society of Scotland staff members who were used to cooking the books and helping their crooked lawyer pals to get off Scot Free and where the remaining CRO staff heavily influence (read dictate) to the SLCC, which crooked Scottish lawyer they have to decide against and which crooked Scottish lawyers have to be allowed to walk free at the GATEWAY STAGE (despite damning incontrovertible evidence against them), so that the same unlawful gerrymandering of the law can be carried out under the orders of the Law Society of Scotland with the advantage that now, they have fixed things so that it looks like the SLCC are the bad guys and that the Law Society of Scotland is no longer in control of letting their crooked Scottish lawyers off, which is exactly what is still happening but the Law Society of Scotland save money into the bargain? It is such a dastardly and sickening perversion of the law, such is the Law Society of Scotland's unquantifiable hatred of victims of crooked Scottish lawyers? Oh, and if anyone is left with any doubts just look at the performance of the SLCC (and remember the SLCC were very reluctant for the Scottish People to see these statistics)? This is what is called closing the stable door after the horse has bolted. Mr Dunion cannot even give the SLCC a veneer of respectability. The SLCC is a dead-man-walking. In fact, it would not be surprising that some staff demit office and turn whistleblower to the DOI journalists to spill the beans on what has been going on for the peace of mind they will have knowing that when this whole mess unravels that they will not be getting charged by the police for assisting in the perverting of the course of justice? They cannot claim that they did something, which was breaking the law because they were told to do so by their bosses? The SLCC have zero credibility and it is inconceivable that a single person left in the country would go to them when they have shown themselves to be a clandestine secretive and unaccountable joke of an organisation? They can claim anything and do anything because they are the law. It is like a Police officer punching you in the face and his colleagues punch you again for reporting him. You have hit the nail on the head with this one for sure. I made a complaint about a solicitor two years ago to the SLCC and you know what happened?His drunken wife blurted out in a bar he had relatives at the complaints body who helped him out and she was right because the complaint was ruled as time barred even though it was made 2 weeks after the court case collapsed and the sheriff blamed him in open court for that too saying the evidence was unintelligible and asked him which side he thought he was working for.I said all this in the complaint and no one paid any attention because they his relation made sure it got no further. I bet they hate you for this one! Explains a lot,lawyers create supposedly independent regulator staffed by their own lawyers! I left a comment on your latest post about the SLCC and now find out they are all linked back to the Law Society or other solicitors.I have a feeling the same is true in our complaint case because the solicitor we complained against has been telling everyone locally the case against him has been closed and also it was said to us he stood up at a local solicitors meeting once and said he had inside information from the SLCC so he must know or works with someone in the SLCC.This is so distressing to know after all we have been put through by him and the SLCC. This is usually referred to as loading the dice or stacking the deck!